Mat Cauthon understood this drink. A hot, dry day of betting on horses in Ebou Dhar requires something that can quench your thirst and cool you down all at once. A “very good hat” is de riguer, but scarf and foxhead medallion are entirely optional. Spearmint! A good 8-10 leaves of the stuff. Not dried. FRESH! See instructions below on how to prepare this. A standard shot is about 1.5 oz. of liquor, so a double shot is 3 oz. Chip recommends Knob Creek Bourbon, but any non-sweet bourbon will do. Crush the mint and ice together. Chip recommends using a mortar and pestle for this step. Get the ice in about 1/2 inch size pieces or smaller. Now put the crushed mint, ice and a double shot of bourbon into a shaker. Chip recommends using a bourbon that is not very sweet since you are about to add a simple syrup to it. Add 2 parts (about 6 oz.) of simple syrup to the shaker. Shake well. Pour into an Old Fashioned glass and serve. If you have an extra sprig of mint, add it to the drink as garnish. 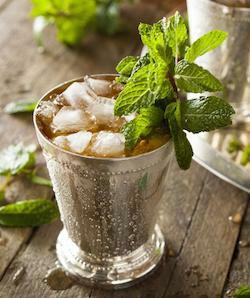 If you really what to impress your guests, invest in a set of traditional silver Mint Julep cups. You can find them on Amazon and they are worth the investment if you think you’ll be making this drink each year. The silver frosts over – which a glass will not do – and it makes the drink that much tastier and refreshing to drink. While spearmint is the traditional “Mint Julep” mint (and the one Chip prefers), you can try this drink with other types of mint. Peppermint is a bit overpowering to use, but apple mint, chocolate mint, and pineapple mint all make refreshing and interesting variations. Feel free to experiment with other varieties of mint and adapt the recipe to suit your own tastes. Another variation is to add mint to the simple syrup itself. Prepare the syrup as above but after you remove the saucepan from the heat and let it cool a bit, pour it over a sprig of mint leaves in a jar and mash them with a wooden spoon. Close the jar and refrigerate overnight. Then, the next day, remove the mint leaves. This syrup – which should be useable for several weeks – adds an extra kick of that minty flavor, so if you really like mint, give it a shot! Finally, nothing looks fancier than adding a special garnish to a cocktail. Set aside some extra sprigs of mint – leaves still attached to stems – and dip them in sugar. Use them to garnish your drinks. It’s just like adding lace to a cuff! Every winter we spend a few weekends creating and testing new drink recipes to share with our friends at JordanCon. Only the best recipes accompany us to Atlanta, usually only one or two. In early 2015, however, we had a particularly long, cold winter; as a result, we ended up with a handful of new recipes to share this past year at JordanCon 7. …Oh, sorry! Wandered off there. Where was I? 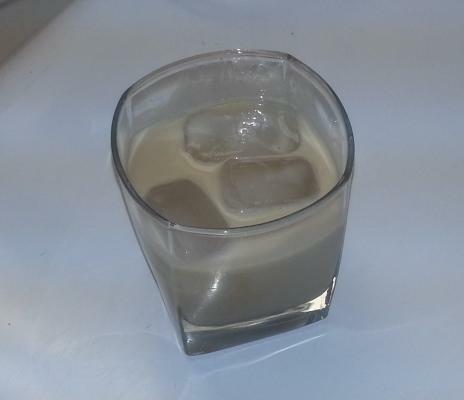 Oh yes, a wonderfully tasty variant of a White Russian that is ideal for a winter’s night. Or Winternight. We’ve heard that the oatey-creamy goodness of this drink is indeed Bela-approved. And now, here’s the recipe! Chip says you should find this one much less complicated than our last recipe. A standard shot is about 1.5 ounces of liquor. You can use another type of coffee creamer or even milk instead if you wish. The nice thing about using coffee creamer is that it is easy to obtain in most hotels! Corsair’s website says Oatrage whiskey is only available seasonally, but we’ve been able to find it most of the time here in Nashville. (Nonetheless, it never hurts to pick it up whenever you run across it, just in case.) And there may be similar oat whiskeys available elsewhere; this is just the one we favor for this drink. Add your ingredients in order to a standard Old Fashioned glass. First add in the Kahlua, then the whiskey, then the coffee creamer. Add the ice, stir, and serve! What’s an Old Fashioned glass? An Old Fashioned glass, also known as a “lowball glass” or “rocks glass” is a short tumbler used for serving whisky with ice cubes (“on the rocks”). It is also normally used to serve certain cocktails, such as the Old Fashioned, from which it receives its name. Old Fashioned glasses typically have a wide brim and a thick base, so that the non-liquid ingredients of a cocktail can be mashed using a muddler before the main liquid ingredients are added. They typically contain 6-10 US fluid ounces. Now that Winter finally seems to be making its presence known, our R&D season here at the Nine Horse Hitch is just beginning. And we still have one or two more recipes to share with you from this past year, so be watching for those soon. In the meantime, may your New Year be filled with happiness and tasty surprises. Every winter we spend a few weekends creating and testing new drink recipes to share with our friends at JordanCon. Only the best recipes accompany us to Atlanta, usually only one or two. This past year, however, we had a particularly long, cold winter; as a result, we ended up with a handful of new recipes to share this year. One of the most dramatic (and requested) of those was a layered cocktail we like to call “The Gathering Storm.” Take a look at the photo below and you should understand why. Chip describes the taste of this drink as akin to a “creamy chocolate orange.” If that sounds delicious to you, here are the details on how to recreate this special cocktail. Keep in mind it may take a few tries to get it just right; luckily, the ingredients are delicious. Be patient. Since this is a “layered” cocktail, make sure you read all the instructions and tips before you begin pouring the ingredients. You can use a different brand of Irish Creme if you have one on hand. Layering makes use of the fact that different types of alcohol will have different specific gravities. As a result, one type may settle into the bottom of the glass, even if you pour it after another type of alcohol. Take a glass tumbler or Old Fashioned glass and pour in your Kahlua. Next, pour Patrón Citrónge orange liqueur over the back of a spoon in a “shot layer” above the Kahlua, i.e., a layer that is the volume of a standard shot. By pouring the liqueur over the back of the spoon (with the pointy end held against one side of the glass), the Patrón will be split across the back of the spoon. This slows it down and keeps it from splooshing into the Kahlua and messing up the layer below before it settles. This may take some practice. You may need a tad more Patrón if you are trying to make even layers. since it will tend to mix a little. Or, you can just use a bit less Kahlua. If it takes a couple of weekends to get it just right, that’s okay – you get to drink your mistakes. Next, clean your spoon (or use a different one), then add the Irish Cream in the same manner: by pouring it over the back of your spoon, to slow it down and keep it from falling straight through your layer of Patrón. These ingredients are best served chilled, but if you didn’t have time to do that, you can always add a couple of ice cubes AFTER the clouds have died down. But if you put them in too early after making the drink, you’ll miss the awesome cloud effect. Now you’re ready to sample your creation. The end result should be a dark beverage with swirling, roiling clouds like those Renald Fanwar saw in the prologue of Book 12. Except these clouds taste like a creamy chocolate orange. Mmmm mmm. Drink a few of these and you too will know “what the Storm means,” so remember to always drink responsibly. Twenty-five years ago “The Eye of the World” was first published, featuring everyone’s favorite sheepherder, Rand al’Thor. 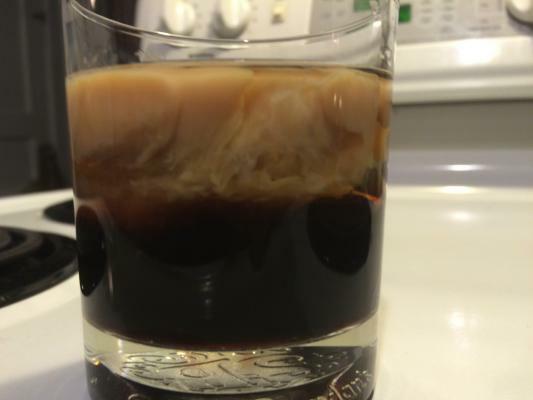 To commemorate that event, we thought it would be a great time to publish our recipe for JordanCon’s version of a White Russian, called, fittingly enough, a Sheepherder. A rich tasting drink that’s slightly chocolatey, yet not too sweet, it’s just the right drink to sit down with as you start your latest re-read. Of course, you can’t have saidin without saidar. If you like your world a little darker, skip on down to our Black Ajah recipe! Chip prefers prefers Smirnoff Silver because it blends well and is pretty neutral, taste-wise. Chip recommends half-and-half since it makes for a lighter taste on the palate. Put 2 oz. of Vodka and 2 oz. of Kahlua in an 8-10 oz. Old Fashioned glass. Add 2 oz. of half-and-half, drop in a couple of ice cubes, and you’re ready to serve. Now that will help you chill out after a long day of protecting the flock! For those of you who aren’t into the Light, use the instructions above but skip the half-and-half. If your heart is truly black, toss in a shot of espresso. All Hail the Great Lord!